Are Burt and Virginia bad parents? By most conventional definitions of the term, the question answers itself. But although Raising Hope has shown Burt and Virginia to be flawed in their child-rearing technique, it is also a show that loves its characters. It’s the kind of love that sees clearly, taking a warts-and-all approach to its subject, but that doesn’t mean that any schmuck can come off the street and start talking trash about the Chances. Not everyone understands them the way the show does; no one who did, and who had his priorities in order, could bear to judge them harshly. It’s like mom’s home cooking. The principal ingredient, after refried lard, is love, and just because I might rather cut my own throat than eat any of it ever again doesn’t mean I won’t kill anyone else who has the effrontery to speak ill of it. Because we love Jimmy, recognizing his essential goodness as we also recognize the low ceiling on his employment prospects, the most truly disturbing thing about the Chances’ parenting style is the possibility that it will continue to impact the next generation. Tonight’s episode begins with Jimmy haranguing his parents for their laziness and slapdash parenting—not because of what it did to him, but because of what it threatens to do to Hope. Babysitting Hope while Jimmy is at work, Burt and Virginia are inclined to take their granddaughter to a Japanese restaurant and park her in front of the fish tank, telling her it’s a trip to the aquarium. (This was Option B, but taking her to the pet store and telling her it’s a zoo would have taken them too far out of their way.) This is the perpetuation of a cycle: When Jimmy was a boy, Burt and Virginia would never take him to a museum, because they had “plenty of old stuff right here in the house.” And when he expressed interest in learning karate, rather than “drive two towns over to where they held the class,” Burt stuck him in front of a kung fu movie on TV and instructed him, “You see that guy in the black pajamas does? You do the same.” I think most of us could get behind that one. Virginia can only respond that, when Jimmy was born, she and Burt “weren’t really prepared for the impact you were gonna have on our leisure time,” adding, “It was a nightmare. You were a nightmare baby. You know that movie The Exorcist? 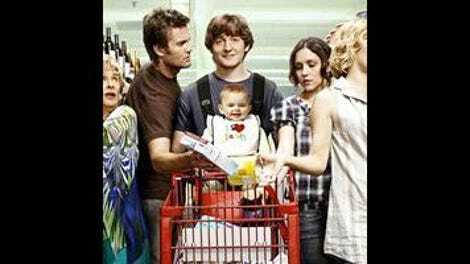 You cried all the way through it.” At this point, Raising Hope virgins might just wonder how the hell the show can possibly turn this around so that the Chances come out in a good light. There’s a time-honored strategy that might come in handy here: When you’re not sure if you can win on your own merits, just make sure you’re in a position to compare yourself to someone who looks a hell of a lot worse. Remember the 2012 presidential election? Or to put it another way: It’s going to be a hell of an opportunity wasted if Chris Klein never gets to play Mitt Romney. Jealous of Jimmy’s admiration for Brad, and by extension, for the adoptive parents he left behind, Burt and Virginia crash the dinner at the swanky country club where Brad has arranged to introduce Jimmy to his mom and dad. (Burt poses as “a rock ’n’ roll equipment manufacturer, and also a private eye.” Garret Dillahunt’s “nobody here but us rich folks” affectations are priceless.) In the end, the truth comes out, and Jimmy is at his most plaintive as he wonders how the fates could be so cruel: His onetime brother is now (in Virginia’s words) “a huge, successful real-estate mongrel,” while Jimmy still says “busketty” instead of “spaghetti.” But that’s all right, because while the Chances have raised Jimmy to be a good person, Mary Gross and her demon brood reveal themselves to be terrible racists. This is an awfully tidy conclusion, but the way Burt, Virginia, and Jimmy all go “Whoa!” in unison—in response to something egregious said by Brad’s daddy—is the second funniest thing I’ve seen on television since Karl Rove tried to use the power of his mind to make the state of Ohio stop going for Obama. The single funniest thing comes a minute or so later, in a joke about special sauce. Both gags carry the same message: Rich or poor, smart or dumb, we’re all in this together, fellow non-douchebags. I feel as if I should be harder on the show for playing that game of contriving some ridiculous new wrinkle in the characters’ backstories for the sake of a hokey setup for this one episode, but before the Chances tell Jimmy they once gave him up for adoption, they try to lie to him about it, and I just love it whenever the show demonstrates Martha Plimpton’s ability to convey absolute, steely conviction when putting across an especially outrageous lie.